Give this one a try for a simple mid week dinner! Heat two lugs of oil in a medium frying pan on medium heat. Finely chop the parsley, sun-dried tomatoes and garlic. Mix into a bowl along with the lemon zest and feta. Cut a pocket into the chicken with a small knife. Fill with the stuffing and fold the chicken across to seal. Add the chicken to the frying pan. Place a lid over the chicken to maintain the heat at moisture. Heat a griddle pan on high heat and place the corn on top to char. Finely cop the coriander, chilli, spring onion and tomatoes and add to a bowl. Continually turn the corn until it’s charred all over. Once the chicken had browned on one side. Turn over and add the rosemary. Cook until the chicken is browned and cooked through. Then chop ready to plate up. Once the corn is charred, cut off the kernels and add to the salad bowl along with a sprinkle of sea salt and olive oil. You’re now ready to plate up! So divide up the salad onto plates and chop the chicken up and pile on top of the salad with a sprig of rosemary. 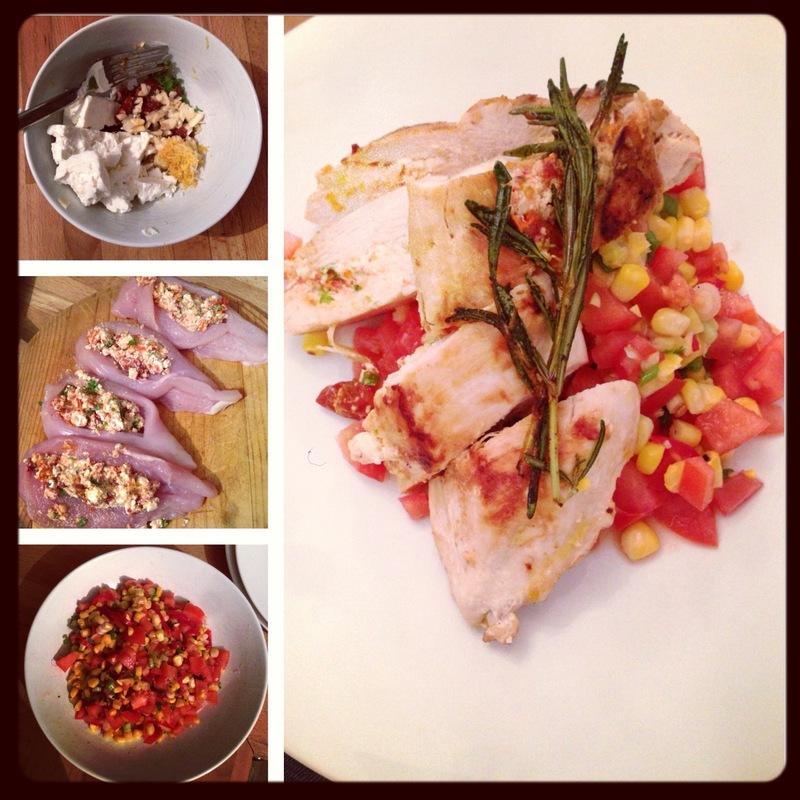 This entry was posted in Kitchen Creative and tagged Chicken, corn, recipe, salad, simple, stuffed, tomato by whysamiam. Bookmark the permalink. Looks delicious and easy! Perfect fare during the week!